Unwieldy file cabinets and physical documents are largely things of the past, and as the world grows increasingly dependent on digital information, workplace clutter is decreasing. It’s unlikely you’ll ever have to maintain and organize hundreds of paper documents—all of that information is simply stored on a computer. The advent of widespread digital documentation simplifies work and generally makes things easier but is not without its challenges. When people deal with physical documents, they likely have a rigid file-sorting structure in place—a system that makes locating documents quick and straightforward. The same should be true when working with computers, but, for whatever reason, this practice is often ignored with digital files. We all have that coworker: their desktop image is barely visible under all of their files; their documents folder is in complete disarray, not to mention downloads. It’s hard to get work done in a messy workspace. Whether it is on a physical desk or your computer’s desktop, jumbled files, reports, and other documents don’t facilitate productivity. A paper-strewn desk is distracting and unprofessional; the same goes for your computer. Depending on your role, you may be responsible for hundreds, if not thousands, of files. Ideally, you should be able to locate any one of them without using your computer’s search feature. If your boss needs a document from a few years back, you want to find it quickly—a consistent folder structure makes this possible. When your computer is well organized, you don’t waste time browsing for one specific file, freeing up time to focus on more important tasks. A fixed file-sorting system also simplifies collaboration. Files used by multiple employees may be saved to a company server where they can be accessed by people across the company. In this case, a folder structure is absolutely essential—otherwise files would be lost in a mess of other employees’ documents. To maintain consistency in a company structure, a file sorting system can be conveyed via an org chart. This diagram communicates the parent-child folder relationships to employees, clarifying where to save and find files. Use this org chart template. Implementing an organizational system is certainly daunting, especially if your files are all over the place. There are endless ways to sort files and folders, but two of the common methods are to sort by project and by quarter. In the first case, the broadest folders (the ones that appear on your desktop or in your documents folder) are named according to project. Each project has its own folder and every file generated over its course is housed in that folder. There are, of course, subfolders. These may represent each team involved, time segments across the project, or the type of files they house. The second instance (by quarter) is also quite straightforward. Parent folders are named by quarter—there would be a 2016-Q2 folder, 2016-Q3, etc. Within these broad folders, the subfolders are again flexible; subfolders should be sorted in the way that makes the most sense for your needs. This may mean combining the two methods described above: the broadest folders are named by quarter, but the subfolders are sorted by project. It should reflect personal preference. In the end, it’s your system; you should find a structure that you like and feels natural. That is as long as it’s easy for others to navigate. 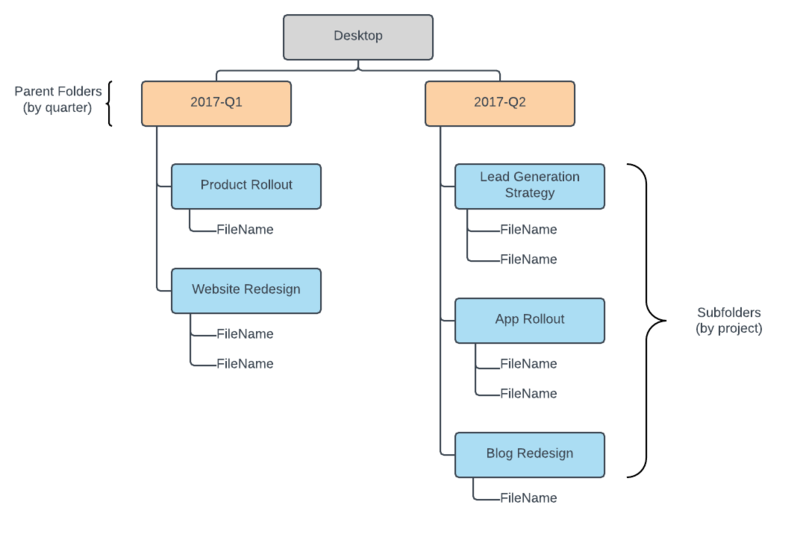 These organizational habits apply not only to files on a computer, but also files within Lucidchart. If you use Lucidchart even somewhat regularly, you’ve probably generated dozens of diagrams, maybe more. The challenges are the same: navigating and finding files can be tough. 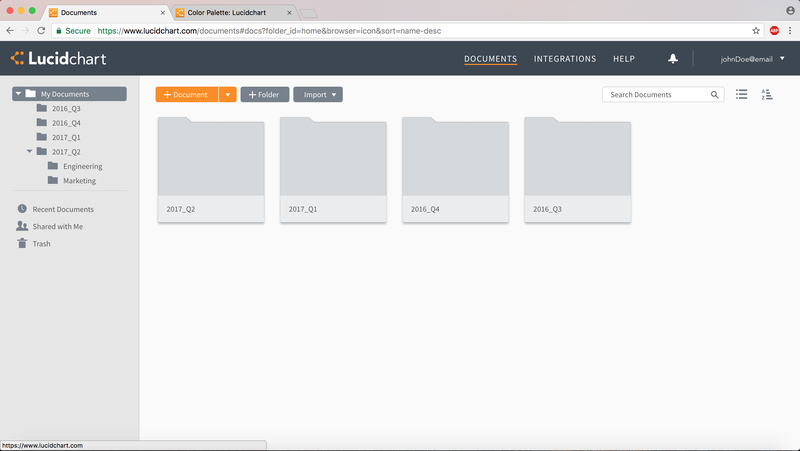 Thankfully, you can sort Lucidchart documents into folders and implement your file sorting system. By default, Lucidchart stores all of your diagrams in the “My Documents” folder. This is the broadest storage location in Lucidchart; everything exists within this folder. The folders that you create in My Documents should be the most general parent folders. 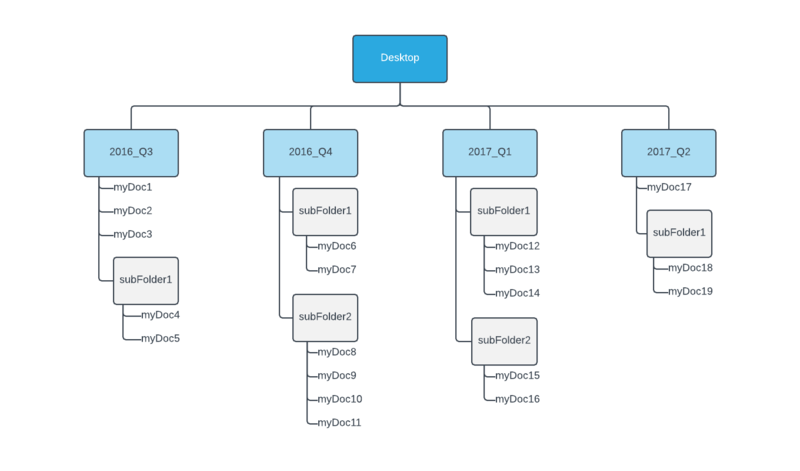 Files and folders in Lucidchart are displayed in either grid or list format—this doesn’t impact your sorting system, it’s really just a matter of personal preference. Within those display modes, content is sorted either alphabetically or by date modified. (These sorting metrics can go both directions. That is Z-A or A-Z; the same goes for date modified.) If you consistently use the same guidelines while naming files, sorting your diagrams alphabetically is the way to go. For example, if you name all of your files based on date—YYYY-MM-fileName—and sort alphabetically, your files will be sorted chronologically by the date you created them. File organization is not difficult and can immensely improve your efficiency. If your computer is a jumbled mess, the time it takes to sort out will be worth it. You’ll be shocked how much time you save when you don’t have to search through hundreds of files across several locations. And always keep in mind that your organizational system is only as good as your commitment to it—pick a system and keep it consistent. Ready to plan your organizational system? 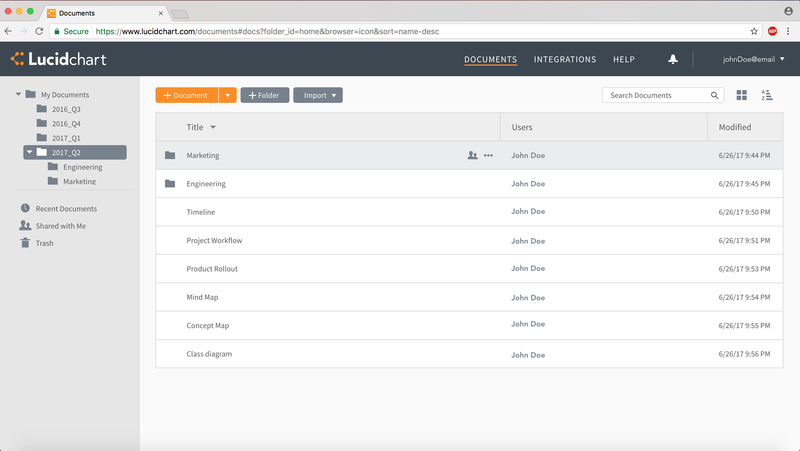 Create org charts with a free Lucidchart account!